For any Deadpool owners that have a moment, we're looking to help Stern analyze the gameplay audits from the collective players base out there to see the frequency of how often various features are started. 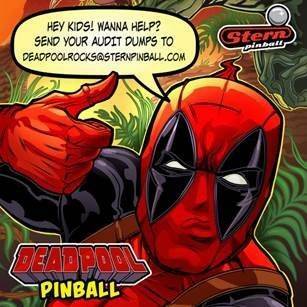 If you're interested in helping, please shoot an email of the audits from your game to "deadpoolrocks@sternpinball.com". If you happen to be an IFPA ranked player, please send your player ID number as well in the email. Are you interested in location #s or just homeowners? I got your email regarding the audits but wasn't clear on exactly what you were looking for. I was at my location tonite but I think I grabbed the wrong ones. They are interested in location audits too crazylevi The Stern Army email after the Deadpool launch mentioned this. This seems like a great sign that Stern is wanting to make some changes to the code to make this game better. Super excited about this as I think it's got some great potential. yeoldpinplayer - I don't have Jessie's personal contact info. If you do, he would probably want to help as well with the audits on his game that is on location. This idea *appears* to have Slim Texton's fingerprints all over it! Jesse is sending them in. I emailed Billy (Pinballz head tech) but I don't know if he's interested in sending them or not. Stern should release a usb WiFi accessory. Supports code updates, collects audits, etc. Helpful to owners and stern. The link goes to Newegg, three different Toshiba SD cards with Eyefi capability. You can probably find others. They already know the game shoots like a dump truck handles curves. Maybe for some. Not for all. I believe they actually can "Audit that" . . . there's a switch at the entrance of that shot, as well as a switch at the top of the made ramp shot. It doesn't take much to compare those audit numbers between those two switches to help investigate what the make percentage is on that shot out in the wild. I'll talk to local op tonight to see if they would be interested in sending audits. BTW. Does Lil'Deadpool Bounce (Mode 3) actually work? Can get 1-2 modes easily (Lil'DP MBall,Frenzy), never any indication 3 is in progress or even ready to go unless I'm missing something. My players are hitting the lock shot pretty regularly but ours is set at 6.7 degrees. BTW. Does Deadpool Bounce (Mode 3) actually work? Can get 1-2 modes easily, never any indication 3 is in progress or even ready to go unless I'm missing something. You talking about mini deadpool? If so, are you completing a battle first before trying to start your 3rd one? I beleive you have to complete a battle before the next mini deadpool MB is available.